When viewing a query in Design view, you might decide to modify the fields that you want to include in the query's output. In other words, you might want to add fields to or remove fields from the query grid. You would do this if you had an existing query and you realized that it was missing fields... I have seen this thread and the answers provided indicated to use the 'Description' property of the query to add a comment on the query. This was for Access 2007 at the newest. Action queries can be used for adding, changing, or deleting multiple records from a Table, record or field at one time. The added benefit of Action query is that user can preview their query results in MS Access before even running it. 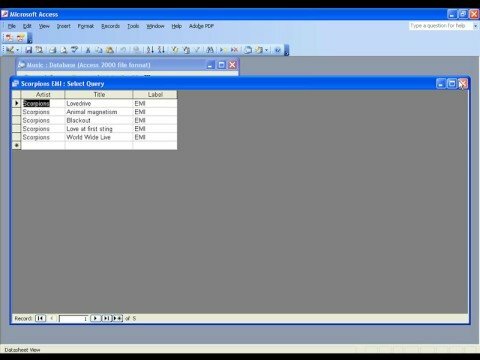 how to download photeos from huawei In Access 2010 Power Shortcuts, Access expert Alicia Katz Pollock shares hundreds of tips and shortcuts to vastly increase efficiency and get the full power out of Access 2010. How to Add Criteria to Your Query. You may want to add selection criteria to your query. Select the qryBookAuthor query that was created in the previous section, and then Right Click and select Design View to open the query in Design view. how to add apps to westinghouse smart tv It can then be manipulated in a query with certain pieces of data extracted into fields and certain records (such as report headers) omitted. An Append type query will take data from one table and use it to add new records to another table. 11/02/2011 · OK, so, I am certain that is something obvious that I am just not seeing. I'm creating some new forms, and I cannot figure out how to add a field from an existing query. Action queries can be used for adding, changing, or deleting multiple records from a Table, record or field at one time. The added benefit of Action query is that user can preview their query results in MS Access before even running it. 28/03/2005 · Hi Mike , I am not sure I full understand the question but here is my reponse. I use access 2003. I click on queries, the click on "new" and then use drag & drop to generate my query.